Manufacturing Technology, Volume I provides a comprehensive introduction to the principles and practice of engineering manufacturing processes. This third edition has been written, updated and expanded to reflect the current requirements of the Advanced GNVQ Engineering syllabus as well as BTEC NC/D Engineering specifications. As such it also forms an ideal introduction to the subject for first-year degree courses in engineering. All illustrations have been reviewed and redrawn. Provides a practical rather than a theoretical approach. Covers all the main manufacturing processes. Now includes self-assessment tasks, end-of-chapter exercises and chapter summaries. Topics covered include: alteration of shape, tooling, toolholding and workholding, kinematics of manufacturing equipment, computer numerical control (CNC assembly, fabrication (including plastics), heat treatment, finishing, quality control, manufacturing relationships, and health and safety at work. This book leads the reader naturally on to the companion volume Manufacturing Technology, Volume 2, intended for those studying engineering manufacture at a more advanced level such as HNC/D and first/second-year engineering degree courses. The broad and in-depth coverage of this two-volume approach ensures that these texts not only satisfy the requirements of technician students up to the highest level but also provide an excellent technical background for undergraduates studying for a degree in mechanical engineering, manufacturing engineering and combined engineering. All illustrations have been reviewed and redrawn. Provides a practical rather than a theoretical approach. 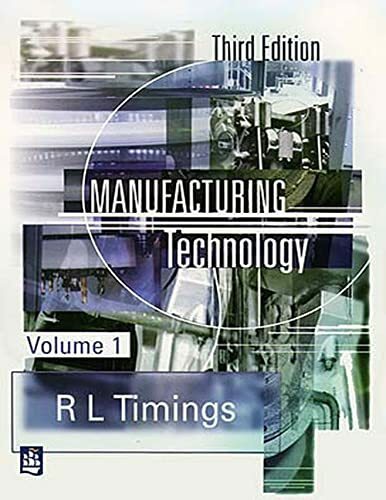 R. L. Timings is the successful author of many engineering textbooks. He was formerly Head of Engineering Department, Henley College, Coventry and is now a consultant.